October is a fairly quiet month in South Africa as everyone gears up for the festive season. The short school holiday already starts on the 29th of September 2018 and ends on the 9th of October 2018, making the 7th and 8th of October two of the most expensive days to travel on this month. Not all routes are negatively affected by this though, so it is worth checking first. As is usual, the cheapest flights can be found on mid-week dates, particularly towards the end of the month. Avoid travelling on Sundays where possible as those are generally the most expensive travel dates. Avoid travelling during the beginning of the month, as the week-long school holiday obviously increases flight prices. If possible, avoid travelling on 6th and 7th of October 2018 as the school holiday draws to a close on those dates. Mid-week flights are more budget-friendly than weekend flights, especially if you're looking at Mondays to Wednesdays. Where possible, try to make your travel arrangements towards the end of the month when flight prices are more affordable. Budget-conscious travellers would do well to avoid travelling on dates highlighted in pink, particularly Fridays, as those are the most expensive travel dates. Flight prices highlighted in green cost less than half that of the flight prices highlighted in pink. Saturday flights are the most budget-friendly on this route this October 2018. Flight prices are incredibly inflated on this route this month. Avoid travelling on dates highlighted in pink if you want to save a little. If you're on a budget you should consider travelling on a Saturday or towards the end of the month as flight prices are much more affordable then. Look to travel on dates highlighted in green if you are on a strict budget or simply looking to save with a little flexibility. Contrary to other routes this month, the most affordable flights can be found during the first week of the month. Affordable flights are incredibly hard to come by on this route, with the only exception on the 4th of October. October usually marks the beginning of the end, that is the end of the year! Shopping malls slowly start putting up Christmas decorations, tinsel starts finding its way onto store shelves and the festive feeling begins brewing. Flights are incredibly expensive on most routes during the first two weeks of the month, as the school holidays only end on the 8th of October 2017. Thereafter weekend flight prices are slightly elevated, especially Sunday prices. Budged conscious travellers will do well to look at mid-week flights toward the end of the month on most routes, as there are no public holidays or long-weekends to cause flight price increases. Look out for dates highlighted in green if you are travelling on a budget and avoid dates in pink where possible. If possible, avoid travelling on Sundays as flight prices are incredibly inflated. Avoid travelling on the first two Sundays of the month, near the start and end of school holidays, if you are on a tight budget. Avoid travelling on dates highlighted in pink where possible, as those are the most expensive flights. Wednesday flights are the cheapest found on this route this October, so try to arrange mid-week flights where possible. Flight prices are high throughout the month, but cheap flights can be found on Mondays later in the month. 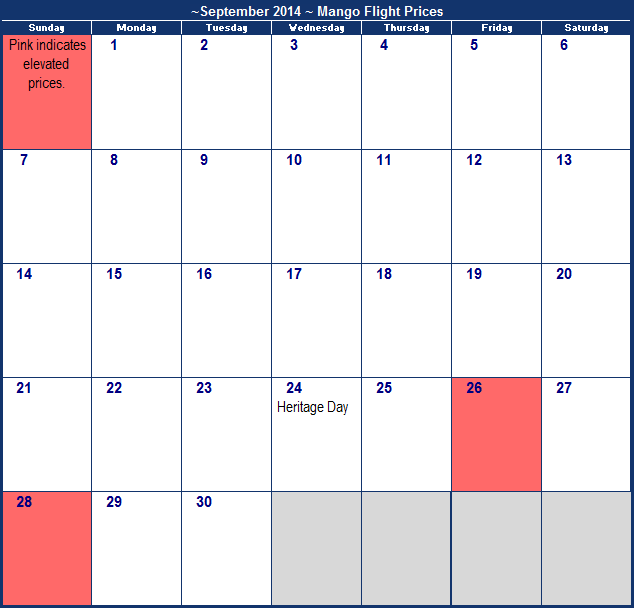 Flight prices are incredibly high throughout the month, but the cheapest flight can be found on the 18th of October. If you are on a tight budget, you should consider travelling mid-week. Sundays are the most expensive days to travel on this month, so try to avoid where possible. Flights are more affordable from the second week of the month, but travellers should avoid travelling on Fridays where possible. Avoid making travel arrangements over weekends where possible, as those flights are incredibly expensive. Deck the halls with bells and holly... fa la la la! Too soon? Not according to the malls, as October is officially reserved for the first glimpse of tinsel. Although the budget might not be there, October is a great time to get a head start on your Christmas shopping. Alternatively it is also a great time to explore out beautiful country, you'll just have to wait for schools to restart! The schools get back into the swing of things on the 10th of October 2016, so make sure you don't have to travel on the 9th as flights will incredibly expensive. Thereafter however we've found flights on most route to very reasonably prices. So there really is no excuse not to book your holiday! This survey was completed on the 20th of September 2016. Avoid travelling on the first of the month if possible, as prices are incredibly elevated. If possible, avoid travelling on the 9th and rather travel n the week thereafter, when flights are more affordable. Travelling during the second half of the mont his considerably more affordable than during the first half. If you're looking for the most cost-effective flight, then you have to travel on the 18th of October 2016. Tuesdays and Wednesdays generally are the cheapest days of the week to travel on, where Fridays are the most expensive. Where possible avoid travelling on the 9th of October, the day before the schools start again. Flight prices are fairly consistent throughout the month, but Wednesdays are still the cheapest day of the week to fly. Wednesdays and Thursdays are the most cost-effective days of the week to fly. If you are on a tight budget, you should consider travelling mid-week or on Saturdays. Avoid travelling on the 9th if possible, rather travel after the school holidays are over. Flights are incredibly affordable throughout the month, with only the 1st to avoid where possible. Weekend travels are the most expensive, rather travel mid-week if you are budget conscious. 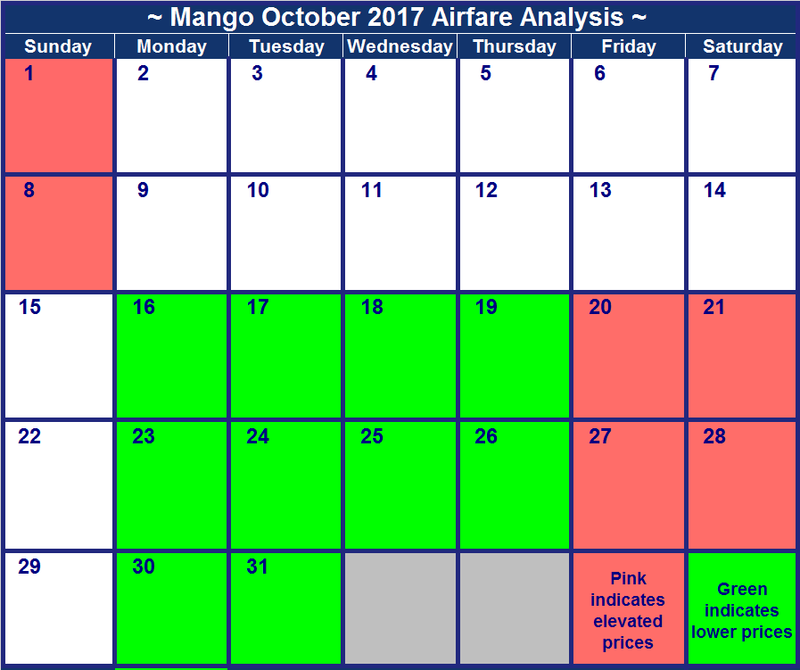 October is a weird month for Mango Airlines. Although there are no public holidays, we do have school holidays starting on the 2nd of October and ending on the 12th of October 2015. Oddly prices are cheaper around the start of the month which is also when the school holidays start. Prices are also not elevated around the 11th when the school holidays end. Best avoid travelling that last week of the month as prices start increasing on most routes. Flight prices were checked on the 22nd of June 2015 and might have changed by the time you consult this. Avoid travelling on the 25th when prices are considerably more expensive than the rest of the month. Prices differ marginally from day to day, except on the first three days of the month when prices are a steal! 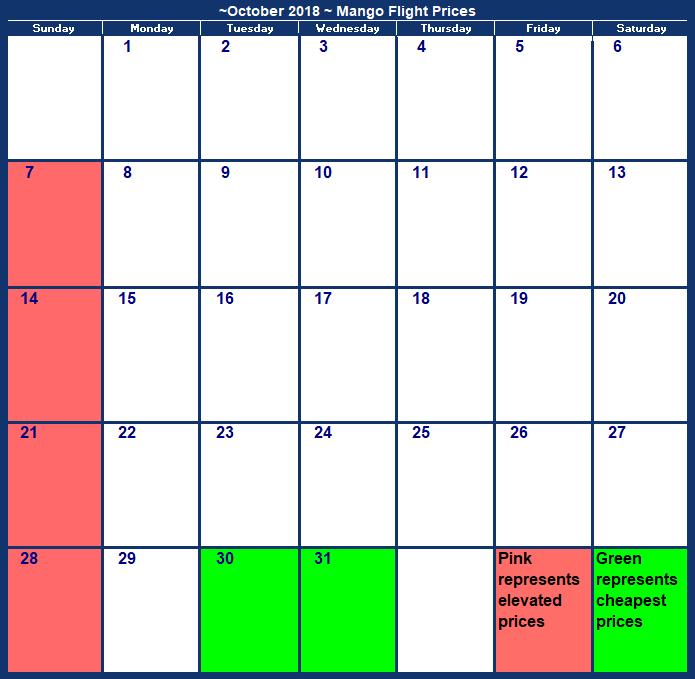 Flight prices are incredibly consistent throughout the month, with only the 2nd and the 3rd to avoid. If possible, avoid travelling on the 10th of October. Get the cheapest flights each week by travelling on a Tuesday or Wednesday. If possible, travel on the first when flight prices are the cheapest. Best travel on the 11th or 23rd if possible as those are the cheapest. Prices are relatively consistent on this route, except on the 11th. Avoid travelling on the fourth when possible, but any date after the 13th is safe. Avoid travelling on the first four days of the month if possible. All flights on this route are relatively affordable. Similar to the Johannesburg to Port Elizabeth route, most flights are relatively affordable with only the last day of the month to avoid. If possible you should avoid travelling the last week of the month as flights are most expensive then. Rather travel during the first four weeks of the month if possible as the last week is the most expensive to travel on. There are no public holidays in October which results in more consistent prices. Generally flights around the end of the month were the most expensive. 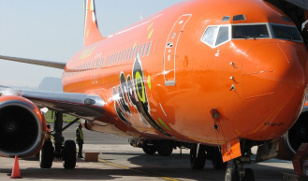 Bookings for Mango October 2014 flights qualify to earn SouthAfrica.TO travel vouchers. Email a writeup of your trip to cheapflights@southafrica.to and we'll send you vouchers. Photos & higher quality writeups get bigger vouchers. This survey was performed on the 26th of May 2014. The longer the length of time since the date of the flight survey, the greater the probability that airfares have changed from those listed below. 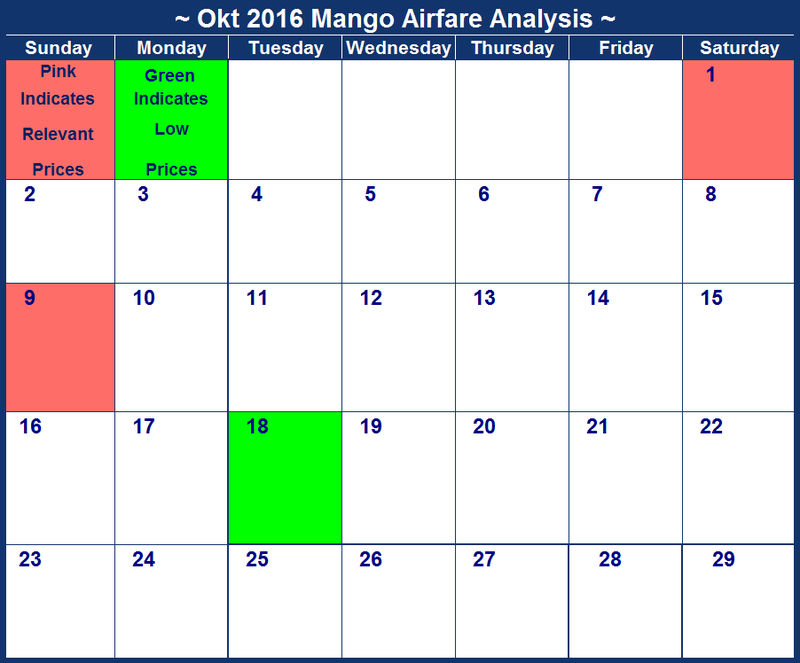 Current airfares may be found at Mango. 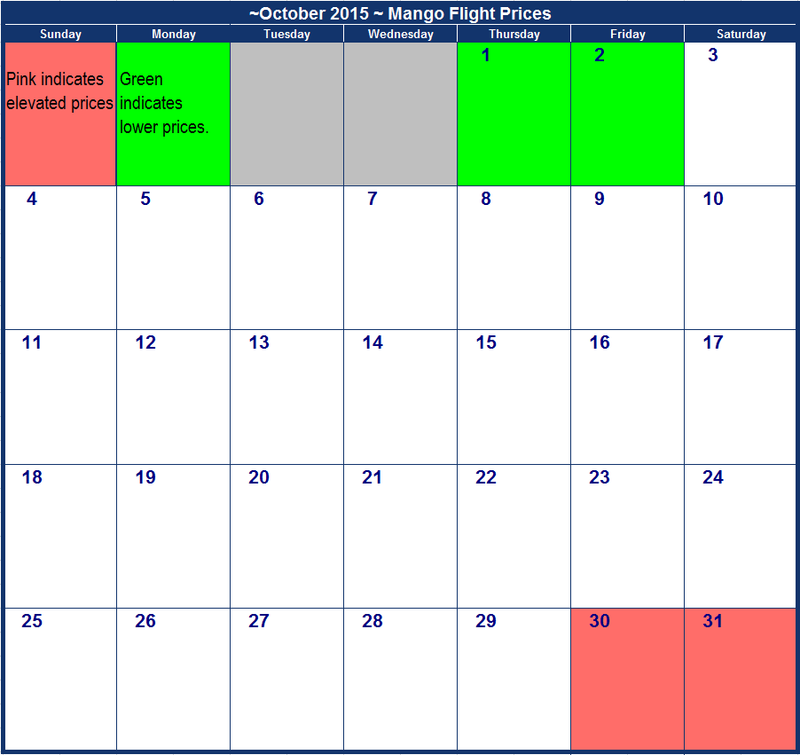 For more information about the airline's flight specials please navigate to our Mango flight prices page. Aim to fly before the end of the month. Prices are elevetated on the 11th and 31st. Flight prices on this route are quite low, except for the 23rd, 24th and 45th as well a the 31st. Flights that depart on the 5th and 6th are the most expensive, so avoid those if you can. Avoid flying on the first weekend of the month or the 31st as it is the most expensive. Prices are highest on the 11th and the end of the month. Avoid flights that depart on the 3rd, 5th, 19th and 20th. Prices on this route are fairly uniform, except for the dates that have been highlighted in pink. Avoid the highlighted dates as they are the most expensive. The last day of the month is the most expensive to fly on. All flights on this route are expensive. Flights on this route are the most expensive and has increased dramatically. Flight prices are consistent though you should avoid the last two days of the month if you can. Flight prices are very consistent.